9. Addictive behaviors: Why and how impaired mental time matters? Brain Research in Addiction, Volume 235, the latest volume in this groundbreaking series on addiction, presents the neurobiological, pathological, cognitive and evolutionary aspects of addiction, with new chapters covering the Neurobiology of drug intake escalation, the Role of the orexinergic system in reward, Mental time travel and addictive behaviors, An evolutionary perspective on addiction- Addiction is the price we pay for innovation and adaptability, and how Cocaine exposure affects object-place recognition memory in non-human primates. 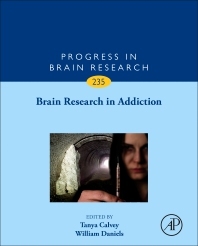 Chapters in this serial are presented by leading researchers from North America, South America, Europe, Africa, Asia and Australia, who present addiction research from the bottom up, including how addiction evolved, basic research on animal models, and the psychiatric, psychological and cognitive characteristics of addictive behaviors in humans. Dr. Tanya Calvey has a background in evolutionary neurobiology and lectures morphological anatomy in the Faculty of Health Sciences, University of the Witwatersrand. Tanya’s current research is on the neuropsychopharmacology of ibogaine and substance use disorders in humans and animals. Her research team is multidisciplinary and her research is funded by the South African Medical Research Council, the South African National Research Foundation and the International Society for Neurochemistry. Tanya is also actively involved in developing neuroscience research in Africa. She is the Secretary of the Southern African Neuroscience Society and the co-founder of the Wits Cortex Club. Willie Daniels obtained his PhD degree from the University of Stellenbosch and completed postdoctoral studies at the University of Texas in San Antonio. He was also a recipient of a Commonwealth Research Fellowship and subsequently spent time at the Wellcome Trust Sanger Institute in Hinxton, Cambridgeshire, UK. Willie is currently the Head of the School of Physiology at the University of the Witwatersrand. Previously he held positions at the University of KwaZulu-Natal, Durban, South Africa (Dean and Head of School of Laboratory Medicine and Medical Sciences) and before that he headed the Division of Medical Physiology at the University of Stellenbosch. His main research thrust entails the use of animal models to study the pathophysiology of neurological and psychiatric diseases. He has published more than 85 papers in renowned journals on addiction, neurodegenerative disorders (Parkinson’s disease, Alzheimer’s disease), epilepsy, stress and anxiety-related disorders and HIV-associated neurocognitive disorders. He has an H-index of 24 and an i10-index of 41 (Google Scholar). Willie has served on a number of professional societies including the Society of Neuroscientists of Africa (SONA) as Secretary-General, the Society for Neuroscience (SfN) as International Affairs Committee member, and the International Brain Research Organization (IBRO) as Council Member.